For sale, under $10,000: "She's All Even"
"Eve" has been a pleasure to work with! 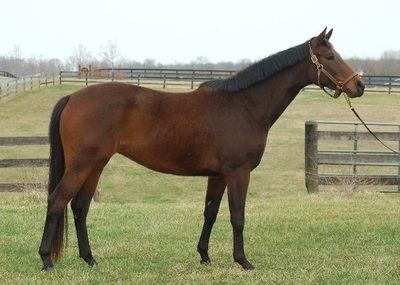 Inner Bay acquired her as a 2017 RRP prospect in mid-June from upstate NY, where she was a winner at Finger Lakes in May. Eve is a big horse in a little package, with a sweeping walk, a powerful trot full of suspension, and such an effortless, oversized canter stride, it's hard to believe she's only 15.1! All in balance, without being hot, or fussy. She has taken to jumping like a duck to water--Joe Fargis says: "There's something real nice about her. She jumps in perfect form." ​ In fact, we are thrilled to continue working with her and excited to see how this exceptional and interesting young mare develops in the upcoming months. Eve is a genuine sport prospect, still priced at under $10K. Inquiries welcome, especially if she can remain in our program, but she will certainly make a lucky someone a very special partner! HAN inspected (Hilltop Farm 7/23/18) and approved for breeding. Mare Performance Test free jumping score 7/7, eligible Premium status on completion of the under saddle portion of MPT. Amy's dam Camille only throws pretty offspring! Amy is Camille's third foal by Grand Prix jumper, As Di Villagana. As Di won over $250K in prize money in his career with Eduardo Braun and Pato Muente, representing Argentina in Nations Cup Competitions. Sold to amateur rider Laura Linback, he won the 100K Toyota Grand Prix, at that time, the finale to HITS Ocala. 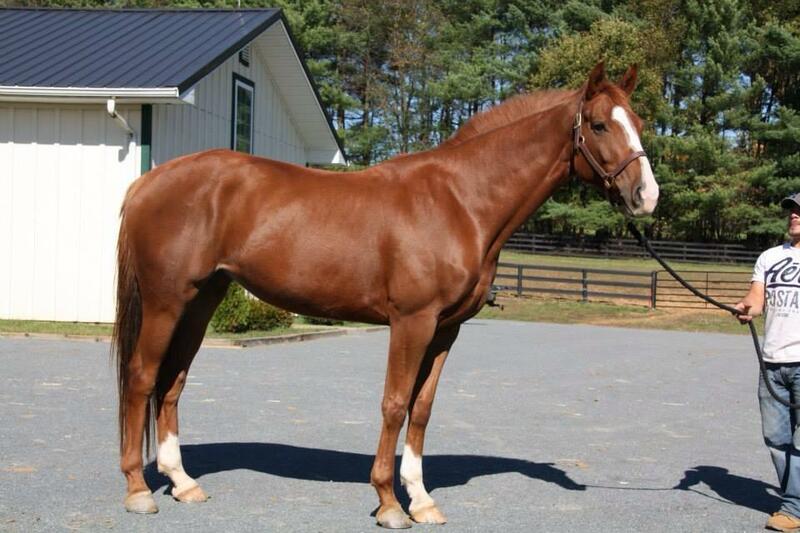 He has sired many approved Hanoverian sons. We expect Amy to mature at just over 16 h. She is a lovely no drama girl with beautiful movement and a natural, stylish jump. She loads, ships, clips, bathes, longes, and has been lightly backed. She is very social, intelligent, and trainable. 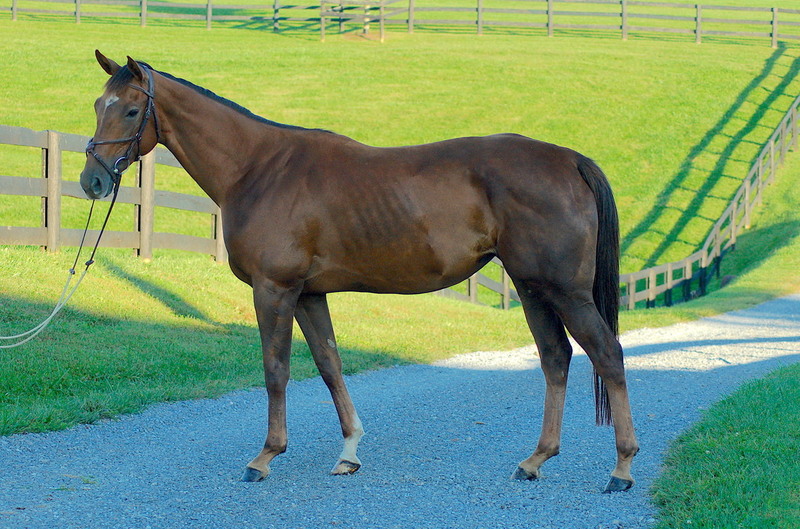 Amy's older full sister (As Di Ani Z) won top hunter breeding ribbons at Upperville (second as a yearling, fourth as a two year old), and produced top level young jumper sold to Olympian); her 2010 full brother (Atherstone, aka As Di Valentia) is a large junior hunter. Amy will be suitable for either ring and has a face that will be a joy to look at over anyone's stall door or pasture gate. Already a jumper at 6 days old! and open speed horse, inspected and approved for breeding by the Selle Français with rare bloodlines including Boran, the sire of Laudanum (more info). 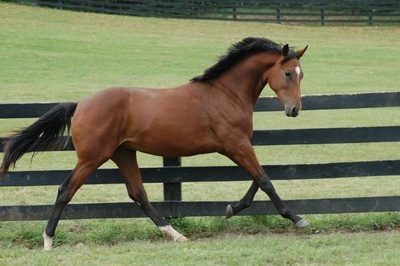 Camille has produced a HB winner on the line who went on to the jumper division, a WEF winner over jumps, and is grand-dam of a top young jumper prospect sold to an Olympian out of this filly’s half sister. Eden Glen is a very correct and strongly built filly, eligible for Hanoverian futurities in 2018 and 2019. Eden comes equipped with a full range of life skills: she leads, loads, clips, bathes, ships, and stands for the farrier. Registered and microchipped. Camille has been bred back to Emerald for a 2018 foal (see full pedigree below). Inquiries regarding purchase or partnership investment on Eden Glen or other offerings are welcome! 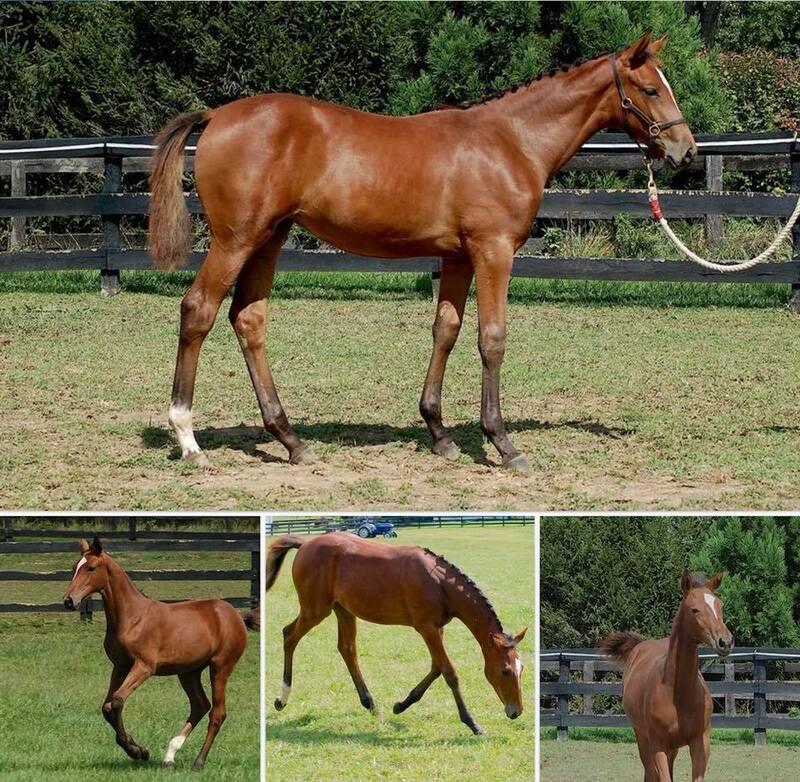 Top prizes at Upperville and Warrenton in Hunter Breeding as a yearling and two year old. Very careful jumper has had limited showing after producing a top jumper prospect by Jaguar Mail, Cougar Trail, sold to CA. Full sister to show hunter "Atherstone," (2010 gelding) owned by Olivia Harvey of GA, aka As Di Valentia, formerly owned by Bill Schaub/Over the HIll Farm (WEF winner/Res.Ch) and to 2015 filly As Di Amedea. Scroll down to see some of the horses we have either bred and sold or found for clients and/or other professionals..
SOLD! Inner Bay homebred Cougar Trail sold to John Charlebois and Will Simpson, of CA! Cougar Trail and Will Simpson won the 4 yo jumper championships at Thunderbird in May of 2016. Homebred As Di Valentia (2010): to Diane Halpin, then to Bill Schaub / Over the Hill Farm, where he began his performance career in the hunter division with a WEF win and reserve championship. Now called "Atherstone," he is owned and loved by Olivia Harvey of GA. Full brother to As Di Ani Z (2008) and As Di Amedea (2015), Atherstone is developing beautifully and looking like he will be a very fancy junior horse! Helicon Corinna sold to Gabby Hero, who placed in the top-ten large green at USEF Pony Finals. Update: Gabby, who started in our deadline program, went on to have a successful junior equitation career under Frank Madden.. We wish her luck in the future and were happy to play a part in her story! Yes No Maybe So (Caesar): teaching short stirrup riders on LI.